Getting a newborn kitten is a great opportunity to mold the young one’s behavior as per your requirement. 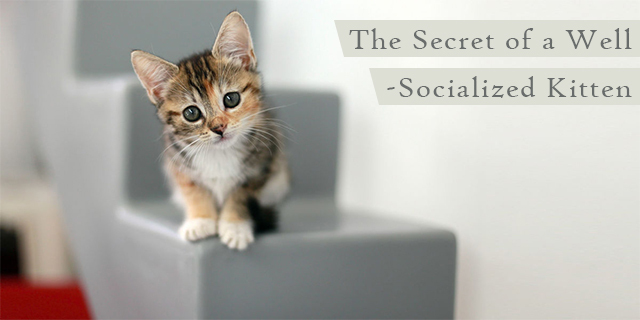 Socializing a new born kitten can be easy as well as a challenging task. It is easy because the kitten has had no experience at all so you have the opportunity to mold her behavior according to your wish. The challenging task is to create positive experiences around her with a variety of stimuli, including mingling with people of different ages and sexes, other pets, going to the veterinarian and being groomed. The key is to expose her to a wide array of experiences so that she grows up being less fearful and an outgoing feline. But the question is when is the right time to give her the desired exposure? There is a short window of opportunity for young kittens for socialization. Most of the kittens get adapted to new circumstances between two to seven weeks of age. This is the time to let them experience new people, pets and places. But this socialization period can extend to 14 weeks depending from kitten to kitten. There are three types of experiences that a young kitten needs to go through to become well-socialized. During the short window of opportunity ensure that your kitten meets a wide array of people, including: men and women, people of different physical abilities, children and elders etc. Ensure that the experiences that your kitten has with these people are positive as if anything goes wrong she will have a lifelong fear of that particular thing. If you have a baby at home ensure that the young kitten gets acquainted with the baby and familiarizes with his smell and sounds. Also ensure that your young pet gets used to wheelchairs, walkers, canes and other mobility devices so that she does not get afraid of them in their later lives. If your kitty grows up being startled to see a person with mobility impairments it can be a perfect recipe for disaster so please avoid this condition at all costs. If your young kitty is part of a litter, she will get enough chances of getting socialized with other felines. But if she is a loner then you should take her for play sessions where she can join fellow kittens after getting her vaccinated and properly taking care of her flea and tick treatments too. Also make her mingle with adult male, female cats along with dogs. Ask your friend who has a dog to come to your house, but ensure that the dog is well-behaved in front of your kitten. Introduce the kitten with the doggy by having him on the leash so that even if things go slightly wrong you have control over the dog so that he cannot cause any harm to your kitty. Also socialize your young kitten with different types of pets like: hamsters, birds, mice, etc. during the short window of opportunity discussed earlier. Young kittens need to be taught to tolerate the grooming process. Start off by trimming her claws, brushing her fur (very important if your kitty has long hair) and get her teeth brushed. Also teach your young friend that being handled by strangers like veterinarian is not a bad or scary thing. Get her acquainted with the holds and other types of gentle restraints utilized by veterinarians and groomers for early practice. It is great that you have adopted a newborn kitty, but remember it takes considerable time and effort from you to transform her into a well-socialized kitten. But the efforts will surely pay off when your kitty becomes highly adaptable and adjustable to lead a great life with you!! So when are you planning to start socializing your young kitten? Post your comments now! !